Flanagan's Outback, Voted Best Place to Watch Sports on TV in Bermuda! There are so many sporting events that are happening everywhere that even the most dedicated fan cannot go to see them all live, especially those in Bermuda who would need to travel non-stop abroad to do so. There is a great substitute though, television, and even better, television in a bar or a pub. There the armchair athletes can share their passion with other like them without being asked to put the volume down or worse to switch to the channel where a soap opera is about to start! It’s a bit like being around the pitch and you can shout and comment with others like you. 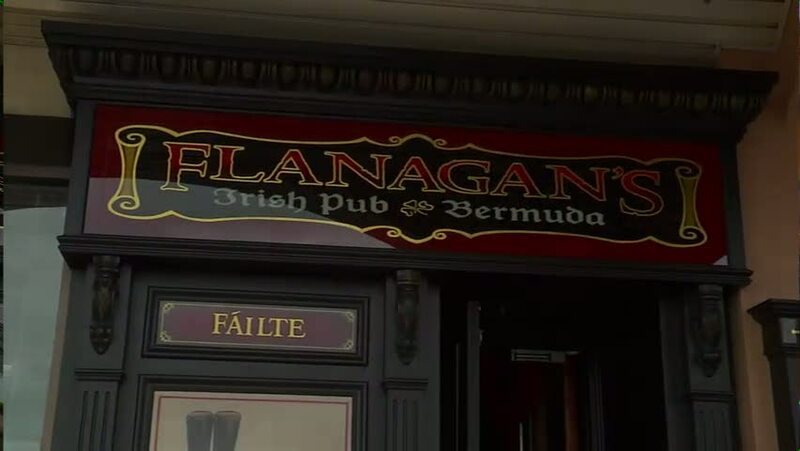 After it was designed the best place to watch televised sports in 2010, the Irish pub Flanagan’s has turned its back room in a place exclusively dedicated to televised sports. The new Flanagan’s Outback Sports Bar is a great success and it has won again in 2011 The Bermudian’s Best of Bermuda Award of best place to watch televised sports. The Outback is located a level below the Flanagan’s Main Bar, on Front Street, Hamilton. It is the only authentic Irish pub in Bermuda and you are guaranteed a great atmosphere while watching your favourite sports event. With its twenty two wide screen high-definition televisions, Flanagan’s is also the best sports bar on the island. Amongst the features of Flanagan’s Outback, sports fans will love the massive sixty-three inch central screen as well as the private booths where you get your own tv and a remote control. Whatever you will choose, you are guaranteed the best seats to any major sports event at Flanagan’s Outback Sports Bar. The only thing you can’t be sure of is that someone will come and comfort you if the team you support loses. But then , if you need a drink to drown your sorrows, you will be at the right place. Of course, television screens and good seats are not enough to make a place the best to watch sports. At Flanagan’s Outback Sports Bar, you will find everything you need to have the best time, with some food such as hot wings and nachos (50 cents wings on Tuesdays, Wednesdays and Thursdays) and beers, drafted and bottled from all around the world. Watch the English Premier League with a cold Carlsberg or the Rugby Union with a pint of Guinness. Flanagan’s does food too in their Main Bar upstairs and they even have a kids menu so you can come with your family for some lunch before going down the Sports Bar and watch your team with the lads. On Wednesdays, they do a Family Night when one child per adult eats free and Marshall the Magician does the entertainment. Or you can all leave your wives and girlfriends getting on with the cocktail list while you getting your regular dose of testosterone-fuelled sports. Flanagan’s is open Monday to Friday between 11am and 1am, and Saturday and Sunday between 9am and 1am. Lunch is served daily between 11am and 5pm, and dinner from 5pm and 11pm. The Main Bar has a balcony area offering stunning views of Hamilton Harbour and Front Street, without doubt the most lively street of Bermuda. Flanagan’s Outback – Part of Elbow Beach Cycles’ Things To Do in Bermuda series!